So I can select suitable configuration for you. 1. This machine with one spindle, one chuck and one backlash. This model support upgrade to two chucks and two backlash. You can mount on material to two chucks and compelete the work piece simultaneously. 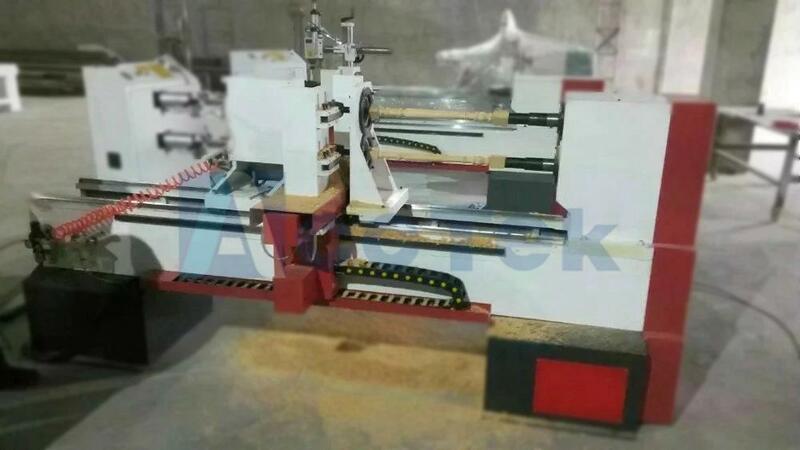 One operator could run 2-3 pcs of cnc wood lathe at the same time for saving salary cost. 2. 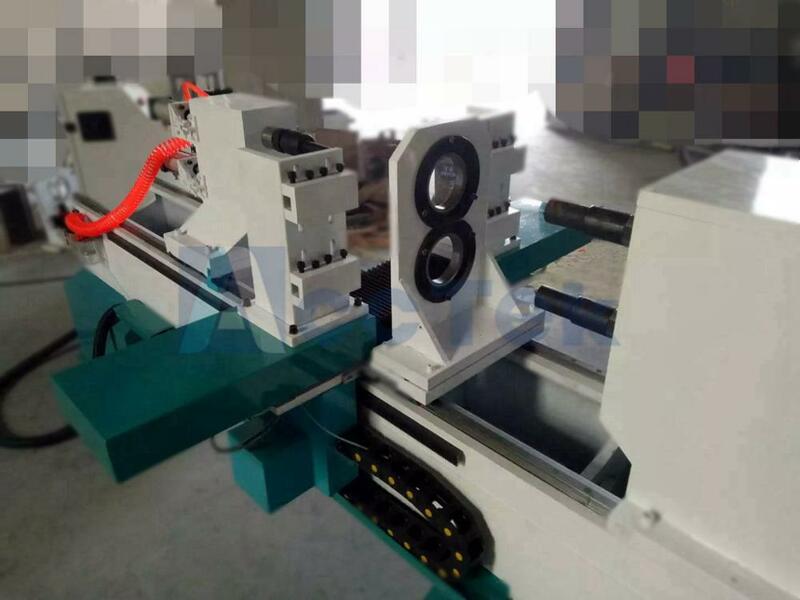 Most Advanced Material Loading Skill: When you load workpiece to cnc wood lathe, you do not have to fix workpiece on the chuck, then get the other edge of workpiece to find the center. 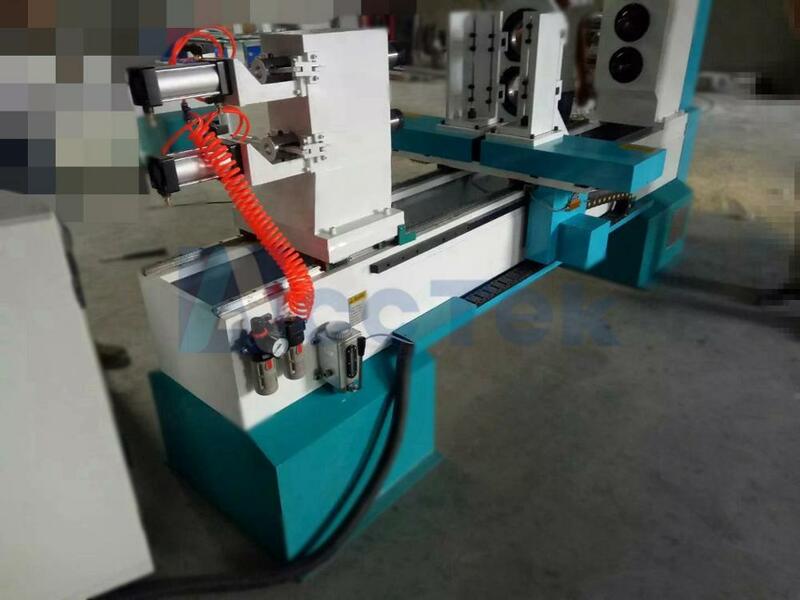 And we loade the workpiece to machine, machine 4 points could help to find the center. And it only takes 3 seconds for whole material loading material, with higher precision then auto loading. When you process larger diameter vase, you could use auto cutter and adjustable air-cylinder, this improve the workpiece surface finish and last the cutter life time. 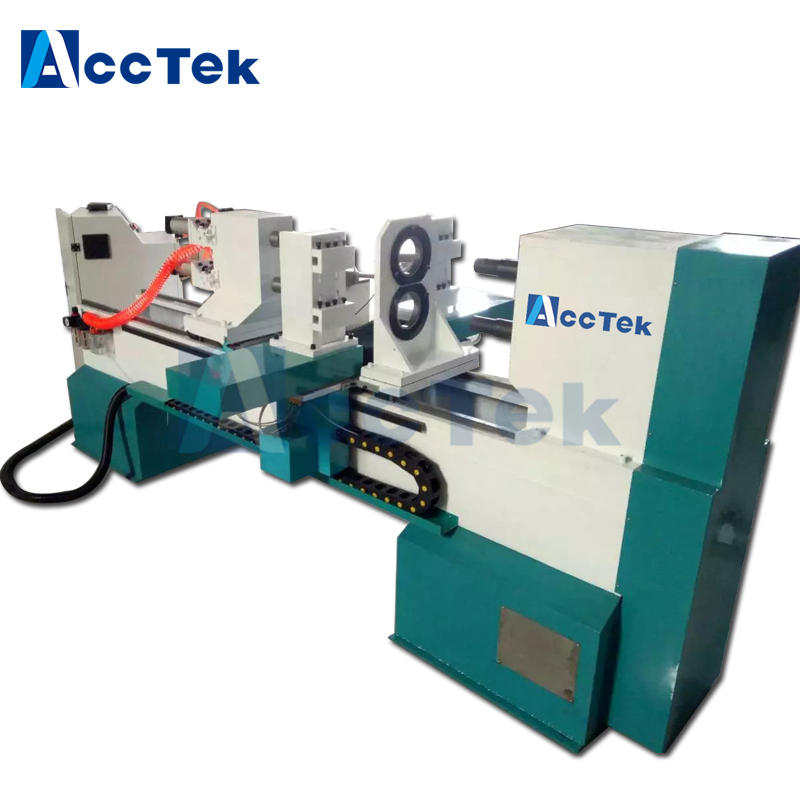 The center supporter fix workpiece center when it is under the condition of self weight. This workpiece center fixing way is with higher precision. 3. Easy Programming. Usually, programing is the important step before working, and this is also a time-spending work. 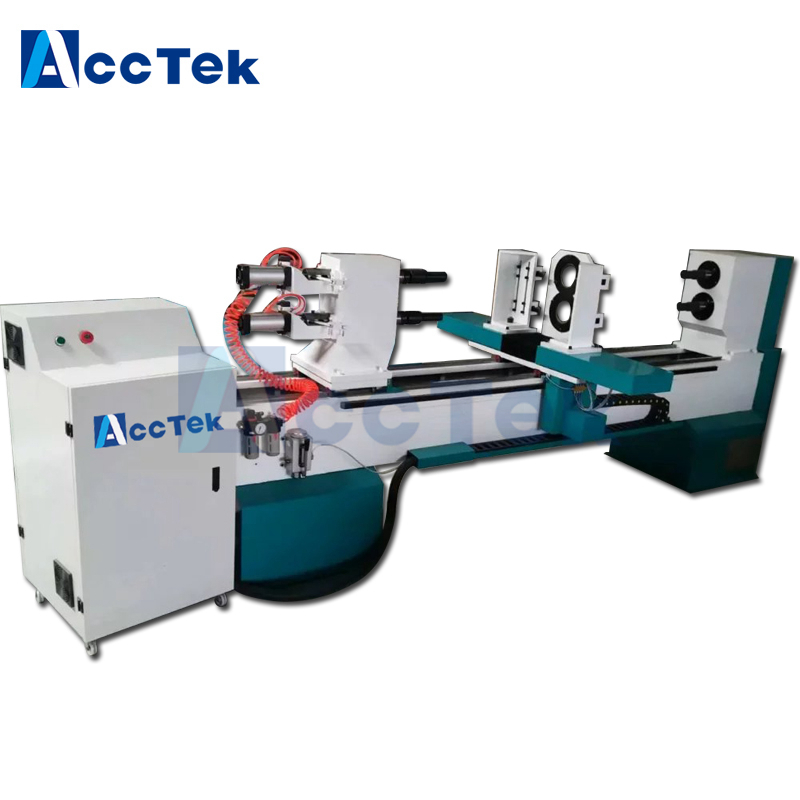 ACCTEK cnc wood lathe program assit you to reduce this time and improve working efficiency for more benefit. ACCTEK programing could be processed with photo. When photo is taken then scan, then could get into programming automatically. And you can measure and change size in the PC directly. 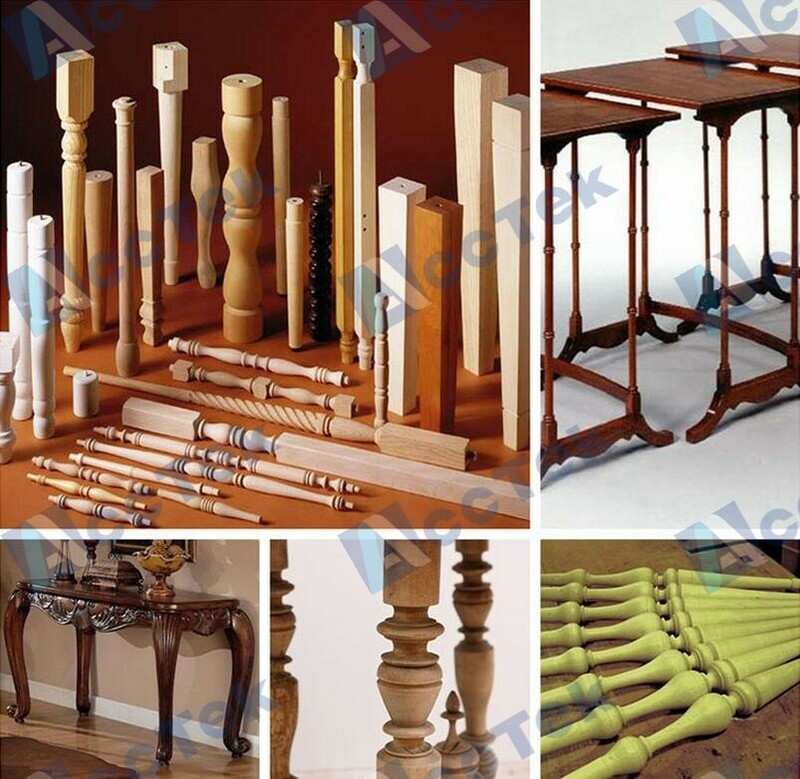 Various cylindrical workpiece, bowl sharp, tubular sharp and vehicle wood crafts, various staircase column, stairway balusters, stairway newel posts, dining table legs, end table legs, sofa table legs, bar stool legs,Roman column, general column, washstand, wooden vase, wooden table, baseball bat, car wooden furniture, children' s bed column, chair arm posts;chair stretchers;sofa and bun feet;bed rails;lamp posts;baseball bats and so on.etc. 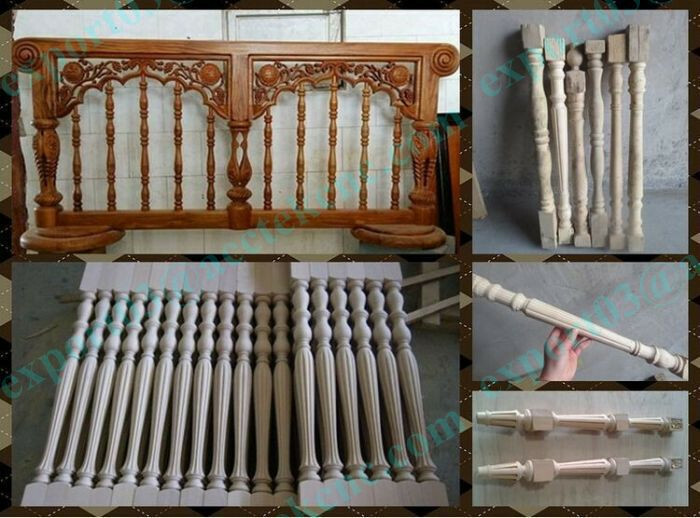 1. service before sales: our salesman will try to know your requirement about our Professional Chinese 2 axis cnc wood lathe, two spindles wood lathe specificaiton and what kind of work you will do . then we will offer our best solution for your requirement. then it can confirm each customer can get their real needed machine. 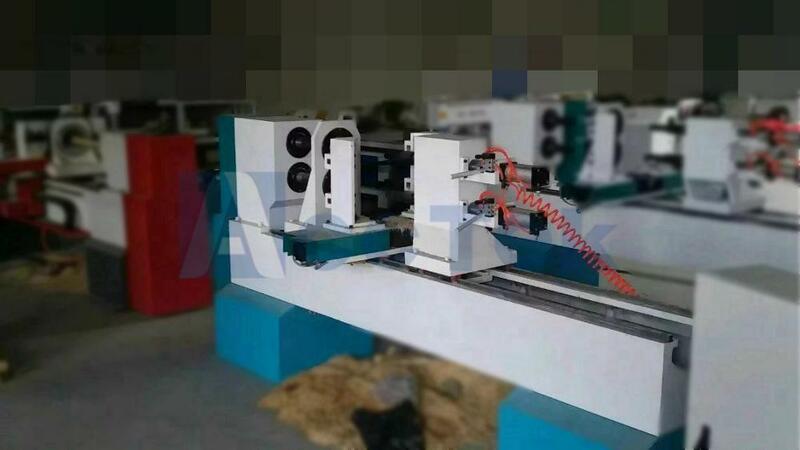 2. service during production: we will send photos of machines during making. 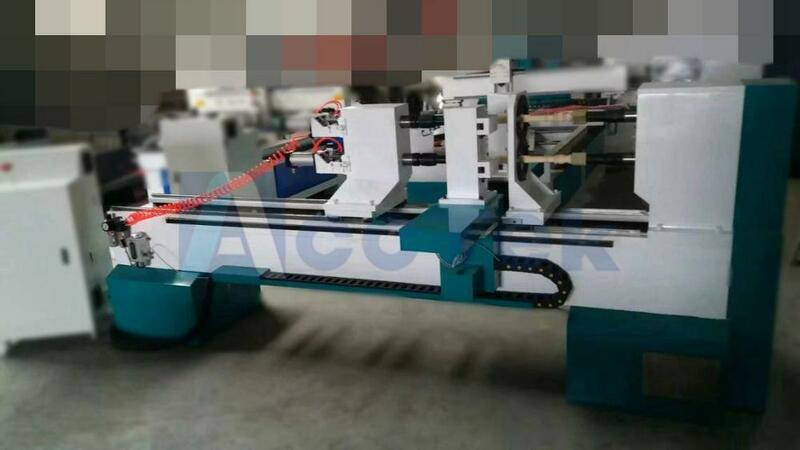 so customers can know more details about the procession of making their machines. and give theirm suggestions. 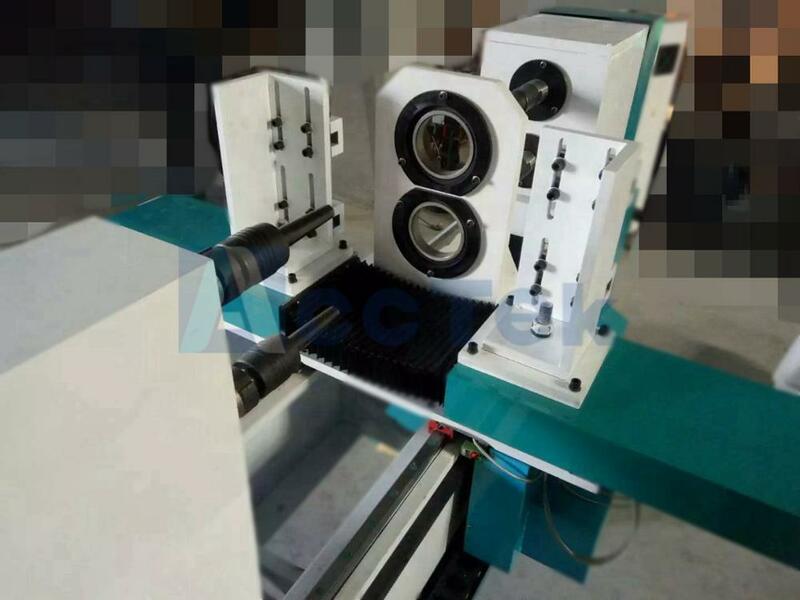 3. service before shipping: we will take photo and confirm with customers the specification of their orders to avoid the mistake of wrong making machines. 4. service after shipping: we will check when the machine arrive your sea port and approximate date of arrival. so customers can know when it will arrive and make enough preparation. 6. service of teaching: there are some manual and video about how to use machine, if some customers have question about it. we will have professional technist to help them to install and teach how to use through skype ,calling, vedio or mail. 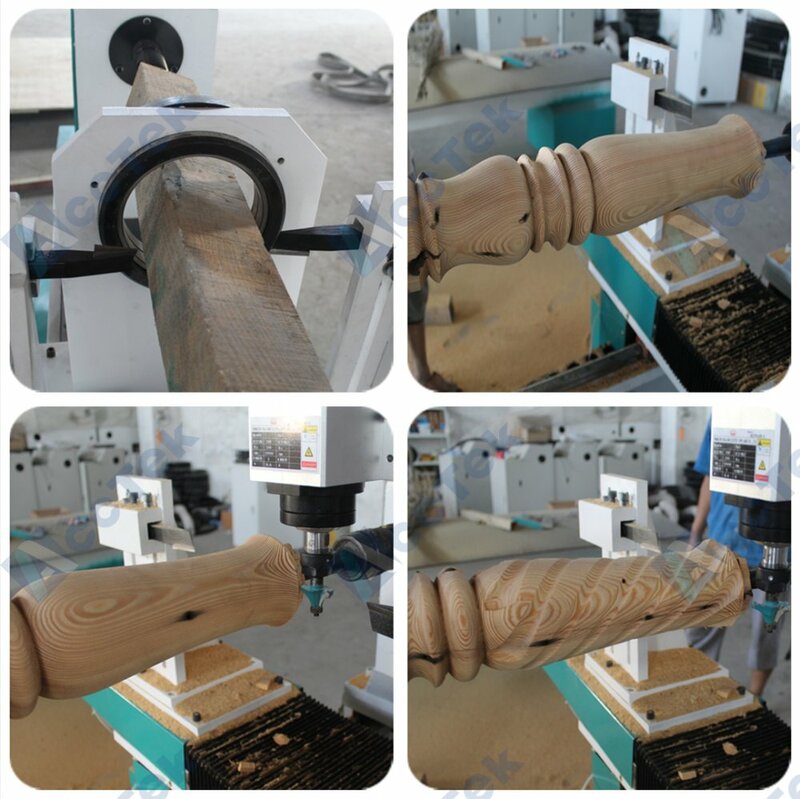 7. service of warranty: we offer 1 year warranty for Professional Chinese 2 axis cnc wood lathe, two spindles wood lathe. if any parts of our machine is broken. we will replace it for free. 8. service in longterm : we hope every customer can use our machine easliy and have a fun of it. if customers have any problems of machine in 2 or 3 , 5 years , they can contact us . we will always here waiting for you.